On June 22, 1996, Michael and I became husband and wife at the Los Angeles Police Academy in Downtown L.A.
Smack in the middle of the busy city, across from Dodger Stadium (and right next to a shooting range, insert your own joke here) is a gorgeous rock garden with a waterfall surrounded by evergreens behind the Academy Clubhouse. It's a tranquil place which honored my Father who retired from the LAPD when I was a young girl. I remember playing in the rock garden when I was in the 2nd or 3rd grade late one night after a Dodger game. When I saw it again after being newly engaged, I knew it was the perfect place for our wedding. This is my favorite photo from that magical day, right after we turned around and the chaplain (whose head you can see behind mine) introduced us for the first time as "Mr. and Mrs. Michael and Heather Chase." Michael is beaming and I am crying and there is so much love and hope and dreams of our future wrapped up in this quick and candid shot. My bouquet is in honor of my name, with Heather blossoms for my first name, Queen Anne's Lace for my middle name of Ann, and lots of Roses for my last name (which I still have, I simply added a hyphen and Chase onto the end of it). I designed my dress after a French gown from the 1700's. (The book I used as a reference is one of the ones I never returned to the library which has accrued 15 years worth of late fees they won't forgive!). My amazing Mom sewed the dress, much to every one's amazement, even her own! My whole life she told me she would make my dress if I gave her twelve months to do it, and I gave her a bonus six months by having an 18-month engagement! She said she never really thought I'd ask her to do it! I didn't make it easy on her because there was no off-the-shelf pattern she could use that fit my design. The end result was beyond my expectations, and I still love it today (which not all brides can claim thirteen years after the fact). My veil is the same one my Mom wore for her wedding, which she had made for her on a trip to Austria in the 1960's. I had a very specific idea for my headpiece and searched in vain high and low up and down the state of California to find what I wanted (this was before the Internet put the world at your fingers) so I finally made it myself. A few years later, tiara-style headpieces became the trend and you could find them everywhere! I looked like a princess, but even more importantly, I felt like royalty, right out of a fairytale. This year we celebrated our 13th anniversary for the second time. My poor math skills are legendary, but you would think I could at least count! At some point around our 11th anniversary, we got it in our heads (and Mike's mom got it on her calendar) that our next anniversary was our 13th. I think it had to do with the fact that by our 11th year of marriage we had moved 13 times... somehow we had "13" on the brain. So last year, we made a bunch of jokes about how our marriage was now a "teenager." And then this year, a few days before what we thought was our 14th anniversary, Michael looked at his trusty Palm PDA and realized that if this year is an odd year, and the year we got married was an even year, there is no way we could be celebrating 14 years of wedded bliss. He called me over and broke the news to me gently... I was devastated! I felt like I'd lost an entire year of my life! Not to mention I was now a total liar! Our marriage was a sham! It was like running a marathon and being told after you'd already finished mile 13 that you hadn't really run it at all and they were moving the finish line another mile away! Fourteen years sounds so much more respectable than thirteen years! For at least an hour, I lamented over our "lost" year of marriage. Michael, reminding me of why I fell in love with him in the first place, stayed calm and reassuring, holding my hand while I rapidly cycled through the seven stages of grief over this horrible gaffe (it should come as no surprise as to where Nathan gets his high strung personality!). After I calmed down, we decided to stick with our original plans of going out for dinner at The Grove LA, where we saw three paparazzi but no celebrities. Other than ourselves of course... because we were seeing stars (and hearts and fireworks) as we gazed into one another's eyes throughout dinner. Ah! Young love! Happy Anniversary to my Dearest! 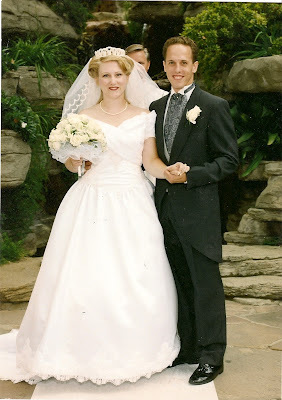 We are doubly lucky to celebrate thirteen years twice!